It seems to have a problem with some objects going black when run from workbench. Should work fine when run from the shell. A solid thumb up anyway! Amazing! It blew me away. this ROCKS! I love you guys! Really good stuff for sure! delicious ... sound and visualwise. To me, it looked quite similar to the original, in fact, it looked a bit like the final version of the original. Which would mean... re-releasing a prod in another party? Really awesome. You guys rule. this is pure. amazing stuff! looks good, sounds mean! Great intro! Sweet effects :) Congrats on first place! 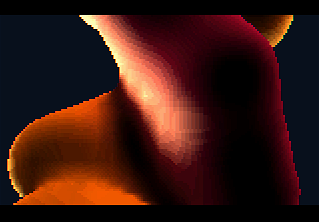 "I think the end result is really gobsmacking when you think about that this is realtime raytracing of metaballs on Amiga :)"
This intro rocks, just as the original Rapo Diablo! There are strange and wonderful things going on in the code department and don't get me started on the sound - it's quite amazing considering it's a 5k intro! I can only dream about creating such beard-y cool samples in a 4k! stingray, our webhosting somehow fucked up the .lha mime-type extension. fixed now. ah thanks psycho :) could finally watch it now and as expected it's cool. :) nice visuals and the tune is cool too. however, it should have been a bit shorter I think. Hm ... not sure about this intro. The music is cool, but the visuals just constantly scream "I'm a PC wannabe" ... Piggie. wonderful final effect there. Its much faster than the original it seems? for some strange reason this one is not working on original hardware, right? Very impressive both visuals and music. five thousand bytes of pure perfection! page created in 0.020727 seconds with 15 queries.